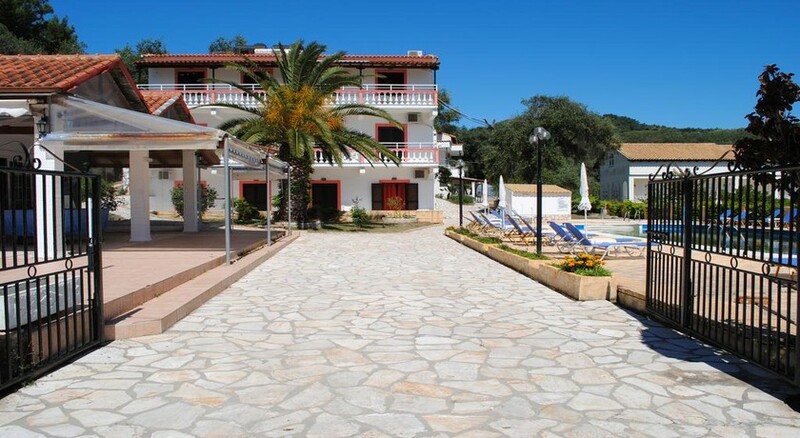 Olgas Hotel is a family friendly hotel located near to the pretty beach of Sidar in the resort paradise of Corfu. Located in close proximity of the Canal 'D Amore cove in the North coast of Corfu (Sidari), the family-run hotel promises a comfortable stay amidst its modern amenities and warm hospitality. Featuring a pool, restaurant and 24-hour front desk, the hotel is well poised to offer guests a home away from home amidst Sun, Sea and beauty of Sidari. Well-appointed guestrooms with amazing sea views, satellite TV, free Wi-Fi and private bathroom with free toiletries invite guests to relax in tranquility. This beach aparthotel also offers a safe deposit box for safe-keeping of your valuables at the front desk and a lift service. Complimentary self-parking for guests is available on-site. Being a family run hotel located on the North coast of Corfu (Sidari), this hotel offers warm Greek hospitality to the guests with lip-smacking authentic Corfiot cuisine from the home kitchen. With the perfect mixture of traditional Greek values and Modern living, Olgas Hotel offers guests a memorable holiday experience in beautiful Sidari. Located in the heart of a scenic location in Corfu, Olgas Hotel is close to fine beaches, the Canal 'D Amore cove and the site to view amazing tangerine sunsets. Sidari’s amazing the clay and sandstone formations are also a short drive away. The nearest airfield, Corfu International Airport is at the distance of 39km. The hotel provides an airport shuttle service (chargeable). Immaculate, well-appointed guestrooms with amazing sea views invite the guests to retire in tranquility after a busy day’s work. The rooms come with satellite TV, phone and private bathroom with free toiletries and hairdryer. There’s a furnished kitchenette with refrigerator where guests can cook their own food. Studio, 1 BR Apartment, 2 BR Apartment and 2BR Family Apartments are the categories of rooms available in the hotel. There is free Wi-Fi in all the rooms. Rooms at Olgas Hotel come with There’s a furnished kitchenette with refrigerator where guests can cook their own food. The hotel has a restaurant that serves home-cooked food with local wines. For an authentic Greek dining experience guests recommend this hotel. There are also few tavernas nearby where you can enjoy tasty cuisine and sip fabulous wine. A poolside bar is on site where guests can unwind with a chilled drink. Sidari’s beautiful shoreline is good for a relaxing walk to take in the beautiful scenery and a trip to the Canal 'D Amore cove. guests can explore the surrounding areas with the hotel’s tour desk or smoke a cigar at the lounge. A short drive away from the famous Canal 'D Amore cove, the hotel prides itself over its superb location. There is a common TV area where screenings of top football games, including UEFA and champions League are regularly held along with family favorites like England's Got Talent and X-Factor. Great holiday spiros need 2 smile a bit more and b patient. Other staff great.